At IWCO Direct, the customer journey begins when our Sales team first makes contact with a prospective client and continues to when we review response rates from the client’s campaign. But the journey doesn’t end there—we treat our clients as business partners, working to make their marketing successful, not as buyers who disappear once their product is in the mail stream. We take results and findings, learn from them, and repeat the cycle, improving results each time. This cadence helps us achieve our ultimate goal of providing positive return on marketing investment (ROMI) on every campaign and program. 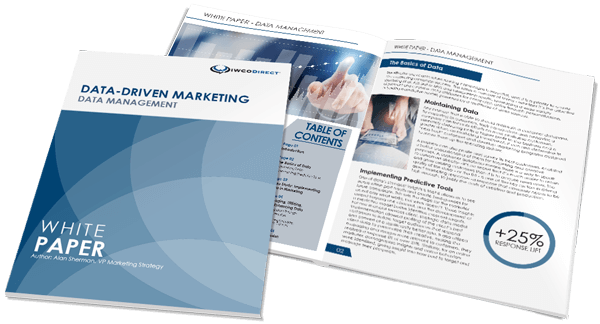 The inputs, systems, and details required to produce a direct mail campaign require a lot of effort and collaboration before the end product is even considered. In fact, we spend the first few weeks in discovery with a client, determining the best way to gather all the necessary materials to make their campaigns a success. We help shape the customer experience with a collaborative approach. We determine how clients can provide input, such as feedback, variables, and data, as well as what kind of input is needed, to support a quick turn time and more seamless process. We then focus on ways to enhance our internal processes to support work, improve quality, reduce lead-time, and utilize tools to get client input in the easiest and most accurate way possible. The customer journey can take many routes depending on the project and its scope, and the work can become very complex. This is why we take such care to make sure all of our internal teams are on the same page and fully understand the requirements of the project and what is needed to complete it efficiently and effectively. Creative Utility, Planning, Prepress, Content Development, and Account Executives are just a few of the partners Client Services depends on for work to move through the process at optimal levels. However, we consider the Sales Executives and Account Executives our clients’ “quarterbacks” who guide them through the process and customer journey. The Sales Executives and Account Executives are responsible for working with all the various departments to ensure workflows, hand-offs, and communications are performing at top levels, as well as communicating with the client so that they are never left out of the loop as to where their project is in the process. Our ability to customize our clients’ customer journeys has a direct correlation to the successful execution of their campaigns. Our focus on communication and collaboration keeps clients up to date and combines the customer experience with the customer journey, letting us support the client and their campaigns from end to end. For more information on how we map out a customer journey for our clients, or to take a deeper dive into how we customize each journey, contact me today.